My copy of The Stanleys Yearbook arrived last week, and my entry in there includes the following samples of published comics work from the past year (July 2004 - June 2005). 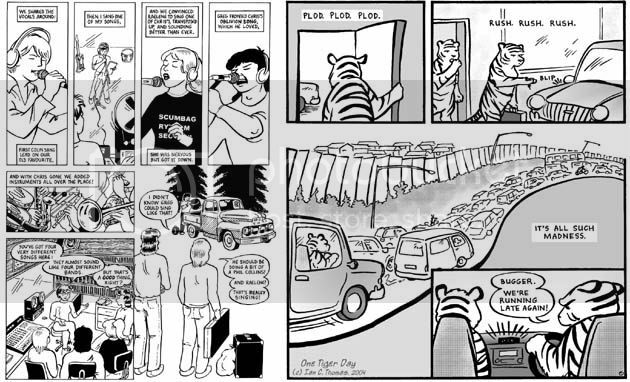 There's a sample page from Riffin' to Oblivion and part of a page from One Tiger Day. These are up for nomination (by Australian Cartoonists' Association members) for the 2005 Stanley Awards. Representing them this way (limited samples) is problematical, as it does tend to work against the humour of the pieces, particularly the extended satirical writing style I mostly use. I think they represent my art pretty well though. WOW, love the cartoons!! Esp the Tiger, I like the bold black and crisp style. I'm keeping my fingers crossed for you and the awards. Also sorry that your bird couldn't come back home. It don't seem right. I'm sure he is missed by your whole family very much. JacqueLynn, the reason the tiger style is bolder (apart from the conscious artistic decisions) is because it is only part of a page, whereas the Riffin' sample is a full page, and also because the Tigers were drawn at A4 and Riffin' at A3. That tiger story is kind of adult-oriented satire :). Good luck, God Bless and everything that will let you win because these cartoons are beautiful! One day, I'll have copies of those cartoons and I'll have a nice time and a good laugh!